Comprised of horizontal serial sections of wood, the AA_02 : Planks + Pixels installation transforms a once socially-deprived voluminous-void into a socially activated replacement. Vacant spaces becomes digitally congealed, eroded and guided over time by a stream of excited energy particulates eroding to expose a striated mass enveloping areas for intimate social interactions to occur. The structure hosts an integrated shelving system where grooves hold the displays of past competition entrants and winners–once vacant space becomes enriched through the cultural narrative of the Anonymous. Cave-like niches within the structure are carved-away to reveal areas for a more informal social interaction whilst allowing for visual connectivity to the main circulatory path below. Central to the affect and effect of the design is the dispersion of light as it filters through a stochastic pattern of pixelated surfaces into the habitable spaces within. 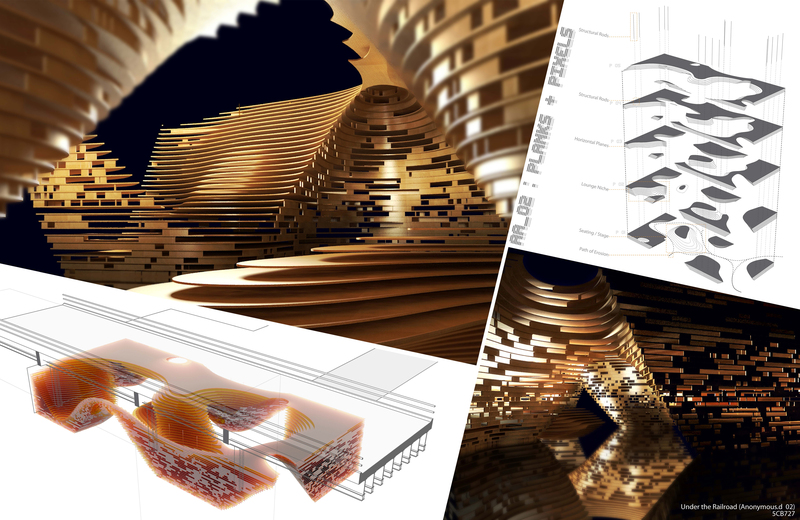 Parametrically derived and algorithmically induced, the structure builds upon a series of equally spaced planes whereby digitally simulated particles emitted at the entry points attract towards points within the volume, creating fluid circulatory paths connecting to lounging niches within. The 2D planes emerge as flat cut-ready sheets to be assembled. A series of vertical structural rods at key instances within the solid volume ground the pavilion and ensures the sheets are spaced at the correct distances, thereby stabilizing the structure. Grooves milled near the edges of the planar elements create tracks where veneer-like sheets create the pixelated pattern and diffuse the light. The entire ambient effect of the installation becomes a space created for the display, circulation, and lounging during the Anonymous exhibition. The design challenges preconceived perceptions of spaces overshadowed by overpasses—carving space to be transformed and actualized into energy-laden environments. Great, thank you for the link.